Find coin values listed here for all US coin series. If it has been awhile since you last checked, prepare for a rare and valuable surprise. You likely have a little silver dime treasure in your box of old coins and because of the increasing price of precious metals any silver dime dated 1964 or earlier is worth at least $1.13 each. Silver quarters are valued at-or-above $2.82 and all pre 1965 silver half dollars are $5.63 or higher... see below. It has become a trend, from one year to the next coin values are constantly on the move. It's time to take another look at your box of old and now more valuable coins. Find the rare dates, mintmarks and the scarce varieties. A rare coin is easy to overlook, at first glance they appear the same as all the rest. Refer to the coin value charts for each series ranging from cents to gold. Another point to consider. Are some of your old coins in a higher more collectible and valuable condition? Is a "condition rarity" in your group? A common date coin in the uncommon "Uncirculated" condition is often highly prized and treasured. Follow the links to the different series. Along with the value charts, each has "Grading" images to compare your coins and judge their condition, discovering their full value. Values listed for cents. From the earliest Half and Large cents, to Indian head pennies to the popular Wheat cents of 1909 to 1958. Match you coins to the grading images and value charts. Some of these old pennies have amazing values. Three Cent Nickel and Three Cent Silver coins are all part of the fascinating series, including many rare dates. Find value in the details, the rare dates, but mostly grading the condition of your coins reveals how much they are worth. Coin value charts and grading images help to identify your rare nickels. Starting with the old Shield nickel first minted in 1866 to the Liberty nickel. Followed by the very popular Buffalo nickel to the Jefferson nickel minted today. Also included is the little know Three Cent Nickel. Scarce today, these small silver coins are sought by dedicated collectors and dealers. The early Bust issues are very rare and highly prized, followed by the classic Seated Liberty design, always a favorite. An important, valuable US coin, check to see how much your half dime is worth today. Dimes are featured here. First minted in 1796 there are many rare and collectible varieties to discover. From the early Bust to the Seated Liberty of 1837-1891. Next the Barber Dime followed by the widely collected Mercury Head dime. Ending with the modern Roosevelt Dimes. Match your coins to the grading images and values charts. Quarter Values listed. With grading images to help value all quarter series. From Bust quarters to Seated Liberty, Barber, Standing Liberty to Washington quarters. For the right coin, values are very high. Discover the rare coin in your box. The result of increased collector demand, your half dollar value is rising. Starting in 1796 with the Bust variety moving to the Seated Liberty Half many are rare. Followed by the Barber Half dollar then the beautiful and popular Walking Liberty, ending with the Franklin Half dollar in 1963. Auction results are showing all are very popular. Bring out your coins and discover today's value. Silver dollar values spanning 140 years. Discover the many rare dates, mint marks and varieties. Evaluate condition to find the true value of your silver dollars. From early Bust Dollars first minted in 1794 to the Liberty Seated variety of 1840-1873. Next the ever popular Morgan Dollars ending with Peace Dollars in 1935. Values are listed starting with the small but rare gold dollar and ending with the huge twenty dollar gold coins. Because the price of gold is rising all gold coins have increased in value greatly. Rare dates, mint marks and condition separate the common from the very valuable. Examine your coins closely compare them to the grading images and find their values listed on the chart. How high are values today? Let's have another look at the coins from the top image. What is your estimate of their value, if you owned them how much could you sell them for? The gold piece is a $10 Liberty in "Uncirculated" condition, meaning it never circulated through commerce. The others are... an average circulated Morgan silver dollar, seven Indian Head pennies that are fairly nice, five buffalo nickels and $1.65 in face value of silver coins. However... there is a surprise. The video above uses the Mercury dime in the image as it reviews the process used by collectors to value coins. After a careful study the dime is judged as scarce and worth far above it underlining silver value. Bring your box of old coins to the desk. Arrange them by denomination and then by "condition" meaning from the most worn to the least. You are ready to consult each coin grading and value chart. If you have a rare date or variety... you will soon discover it. Coin values are influenced by a series popularity. Large numbers of collectors create demand showing in premiums paid for coins. Collecting interests are ranked on charts by denomination and series. Separate your old wheat pennies into the main value groups - different decades, mintmarks, rare dates and importantly condition. Preparing and selling wheat pennies for the best value is possible. 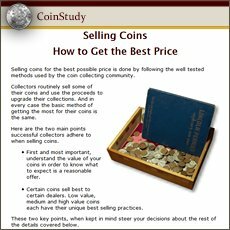 An excellent picture index of all major US coin series. Identify your coin, click on the image or link and go immediately to your old coin value. Every coin series has its share of rare dates and mints. From cents to silver dollars to gold the top rare coins with values are listed. If these rarities are not in you box of old coins many others are still very valuable, follow the links to complete value listings. A short series highlighted by a couple of rare dates and a rare variety. A careful look at your 2 cent coins is necessary. Examine your coins, compare them to the grading images and discover today's solid values. The Coin Value Guide covers US coin series from Half Cents to $20 gold coins. For more background information showing how values listed in the guide are determined and getting the most value from the guide, here is a quick, behind the scene look. Many of your old US silver coin values are tied closely to the price of silver. Silver dimes, quarters, half dollars and silver dollars are all heavy with 90% silver and worth many times their face value. With today's high value of silver your old coins are becoming surprisingly valuable.